True -- IF your only source of information is that story or that news source. And that's the motivation behind the FakeNews claims: "You should only listen to me! I, and only I will tell you what is true and what to believe"
But, strangely, truth remains true no matter how the individual facts are spun or cherry picked. "If you don't want negative search results, don't do negative things"
In Apple Messages, try substituting a few different professions for the word “profession” in the following phrase and see what words are given as candidates for the next word. No conspiracy to see here, this is simply what gets generated by the algorithm based on the available data set. On DDG, I got a picture of Trump (#5) and Barbra Streisand (#6). Appropriate I think. You bring up a good point, since we know Google does skew search results based on what they may know about you the end results for one person may be different for someone else. I have proven this over an over again. I personally have search Google with my direct IP address as well behind an anonymizing VPN connection and from different countries and the results are different each time. I even done the exact same search from my wife work computer and had different first page results come up over mine computer. This is generally true for general or non specific searches, If your search is very specific and there only a limited number of answers than the returned results are close to the same. In this case if Google knows you hate Trump may you will see more idiot Trump picture than someone who has no preference one way or another. In the end Google is controlling what you see based on what they know about you, and people who have any knowledge how searches are done and how google prioritizes things can make sure you see what they want you to see. 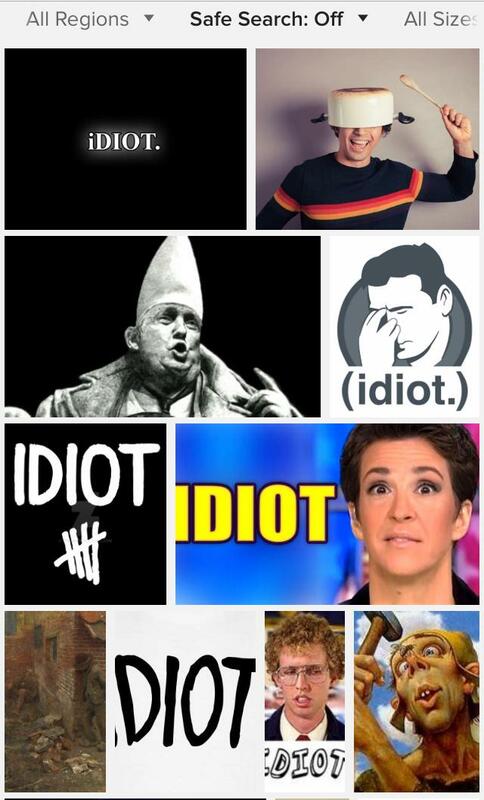 Google could fix this, but will not, we know they can analysis pictures and knows what is in the picture, they could simple filter our the Trump picture from the search of Idiot based on knowing Trump is in the picture. For all we know they could be doing this and in fact are just including Trump as part of the idiot search. Unless you can see the code and the word mapping database you can not be sure. You bring up a good point, since we know Google does skew search results based on what they may know about you the end results for one person may be different for someone else. In the end Google is sourcing the initial results it believes you are looking for, which is what nearly all of us expect. Otherwise you'd go looking for another search engine. Right? But no I don't consider Google to be controlling what I see since I very often will dig deeper if the first results aren't satisfactory, and far more often than not I can find just the document, or source, or quote, or word, or image or research paper, or whatever that I'm wanting. Generally quickly too as my previous search results that perhaps used obscure sites or resources now help surface the right search results that follow far easier. You can do the same.